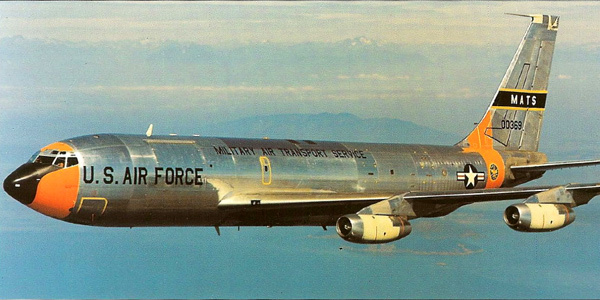 Fifty years ago, on June 25, 1965, at 0135, an Air Force C-135A Stratolifter took off in fog and light drizzle from Marine Corps Air Station El Toro (in what in now Irvine’s Great Park) and headed for Okinawa. Aboard were 12 U.S. Air Force crew members and 72 U.S. Marines on their way to join the fight in Vietnam. At 0146, about 4 miles from the control tower, the jet disappeared from radar. For reasons still unknown, the plane did not (or could not) make a planned left turn and instead flew directly into Loma Ridge. The plane was destroyed on impact, killing all 84 people on board. It was the worst air disaster in California history. At the time of the crash, a Marine officer said if the plane lacked power and went into its bank “it might have wiped out a part of [the City of] Orange.” He speculated that the pilot might have acted to avert an even worse disaster by keeping the plane on a straight course. 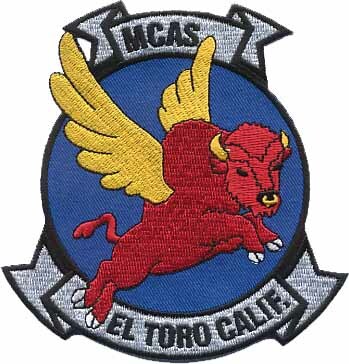 This Saturday, June 27, 2015, in MCAS El Toro’s historic Hanger 244 in the Great Park, there will be a Dedication Ceremony of a Memorial Kiosk designed by local Eagle Scout Jordan Fourcher honoring the United States Airmen and Marines who perished in the Loma Ridge crash. 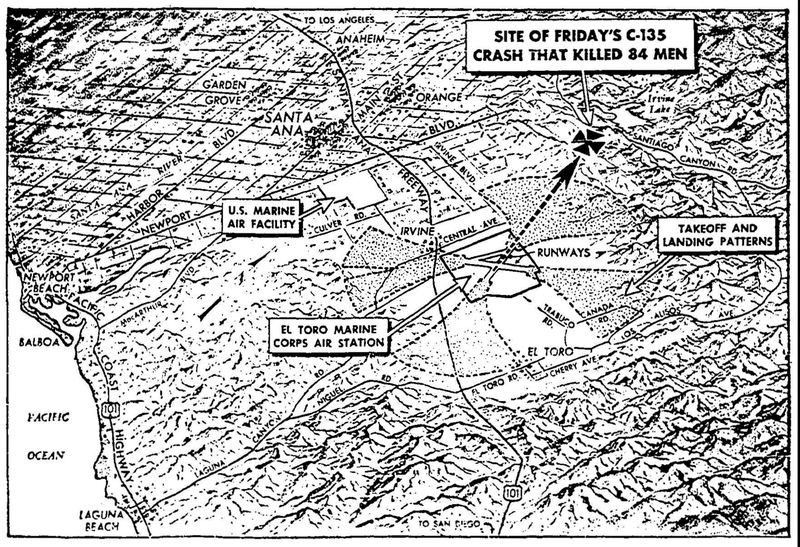 Map showing location of where U.S. Air Force C-135 aircraft crashed after leaving El Toro Marine Corps Air Station killing all 84 on board. This graphic was published in the June 26, 1965 Los Angeles Times. The Memorial Dedication Ceremony will take place from 1:00 to 3:00 p.m. and is free and open to the public. There will be a Missing Man formation flyover with WWII aircraft. Relatives of the men who lost their lives in the crash and many veterans who served with them will be in attendance. Please dress business casual. The U.S. Marine Corps and Boy Scout Honor and Color Guard will be in Full Dress Uniforms. Pictures and memories of the 84 Airmen and Marines who perished can be found at the 1965 El Toro Marine Crash Memorial Page. This is another opportunity to learn more about Irvine’s proud military heritage and why the former MCAS El Toro continues to hold such tremendous significance for area veterans. 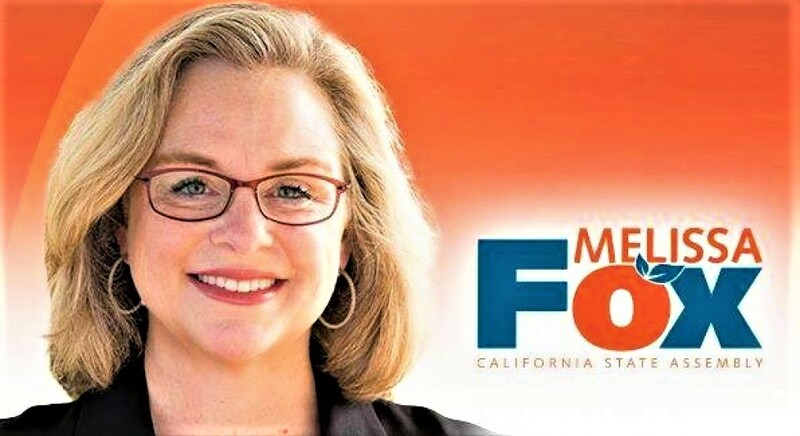 As the daughter of a combat veteran and as an Irvine resident, I believe that a portion of the Great Park in Irvine, once the El Toro Marine Corps Air Station, is the perfect location for a Veterans Cemetery and Memorial and a fitting commemoration of Irvine’s proud military heritage. I strongly support the veterans who are now insisting that the Irvine City Council keep its promise. PFC Roger J. Beiter, 18, W. Seneca, N. Y.
Lance Cpl William B. Breen, 20, Bellefonte, Penn. Cpl James Harold Brock, 25, Birmingham, Ohio. Cpl Emerson K. Brown, 24, Kent, Wash.
Lance Cpl Jimmie E. Brown, 24. Lance Cpl John G. Brusso, Jr., 22, Ontario, N. Y.
Cpl George C. Burrow, 20, Norman, Ark. Cpl Tucker Ross Burt, 24, Mt. Vernon, Ohio. Cpl Paul T. Chapin, 21, Coronado, Calif.
Cpl George E. College, 21, Davisburg, Mich.
Lance Cpl Douglas D. Everett, 19, Allentown, Pa.
PFC Rosco Ford, 24, Miami, Fla.
Capt Victor M. Girodengo, 28, San Diego, Calif.
Cpl Thomas Barton Gladstone, 25, Largo, Fla.
PFC Dickie L. Glover, 32, Muskegon, Mich.
PFC Gerald Griffith, 18, Jackson, Miss. Lance Cpl Howard D. Hall, 18, Winfield, Kan.
Lance Cpl Gail K. Haning, 23, Albany, Ohio. Cpl Charles Harmon, 21, Estill, S. C.
Lance Cpl Robert E. Harvey, 18, Upland, Calif.
PFC Harry R. Hawk, 20, Oberlin, Penn. PFC Gerald G. Hawkins, 18, Mableton, Ga.
Lance Cpl Danny E. Holder, 18, Nashville, Tenn.
PFC James T. Kitchens, 19, Madleton, Ga.
Cpl William R. Kittel, 28, Suisun City, Calif.
Sgt James E. Lee, 28, Compton, Calif.
Cpl Michael J. Mando, JR., 22, Tayler, Pa.
Lance Cpl Brian Elvin Martin, 20, Minersville, Pa.
Cpl James V. Matruski, 23, Johnson City, N. Y.
PFC Joseph D Mogelinski, 18, Greenfield, Mass. Capt Edward M. Morehead, 27, Pittsburgh, Pa.
Sgt James C. Moultrie, 18, Moza City, Okinawa. Cpl Anthony E. Nelson, 22, Wilmington, Calif.
PFC Franklin Newman, 20, Loomis, N. J.
Cpl Rich G. Pacheco, 20, Portland, Ore.
Lance Cpl Enrique Danny Padilla, 20, Santa Rosa, N. M.
Cpl Michael A. Palmieri, 28, Elmira, N. Y.
Lance Cpl Alfred Eugene Peterson, 20, Littleton Commons, Mass. PFC Robert J. Rhodes, 19, Patterson, N. J.
PFC Ronald Richard Richert, 18, Pontiac, Mich.
Pvt. Robert S. Shedis, 22, Calumet Park, Ill.
PFC Joseph B. Sheppard, 18, Philadelphia, Pa.
Sgt Gerald Skidmore, 18, Cincinnati, Ohio. PFC Arthur Slaughter, 23, Pittsburgh, Pa.
Lance Cpl Charles L. Stevens, 18, Cambridge, Ohio. Lance Cpl James C. Tischer, 20, Hannibal, Mo. PFC Lawrence R. Vanness, 19, Rochester, N. Y.
Cpl Harrison Wallace, 25, Clemens, Ala. This entry was posted in El Toro Crash and tagged 1965 El Toro Crash, 1965 El Toro Marine Crash, 1965 El Toro Marine Crash Memorial Page, AB 1453, Air Force C-135A Stratolifter, Assembly Bill 1453, Boy Scouts of America, C-135A Stratolifter, California Assembly Committee on Veterans Affairs, California veterans, California veterans cemetery, City of Irvine, Eagle Scout, Eagle Scout Jordan Fourcher, Eagle Scout Project, El Toro Marine Base, El Toro Marine Corps Air Station, Great Park, Great Park Hanger 244, Great Park Heritage and Aviation Exhibition, Great Park Irvine, Hanger 244, Heritage and Aviation Exhibition, Irvine, Irvine City Council, Irvine Community Services Commission, Irvine Community Services Commissioner Melissa Fox, Irvine veterans, Jordan Fourcher, Loma Ridge, Loma Ridge crash, Marine Corps Air Station El Toro, Marines, MCAS El Toro, Melissa Fox, Melissa Fox blog, Melissa Fox Irvine, Melissa Fox veterans, melissafoxblog, melissafoxblog.com, melissajoifox, N3N Canary, orange county ca veterans cemetery, Orange County Great Park, Orange County veterans, Orange County veterans cemetery, Orange County Veterans Memorial Park, SNJ-5 Texan, veterans, veterans cemetery, veterans in California, veterans in Irvine, veterans legislation, veterans legislation California, Walt Disney, Walt Disney and World War 2, Walt Disney Studio. Bookmark the permalink.